Two adult female black bears that were burned during the Thomas Fire in Southern California have recuperated and are now back in the wild thanks to the help of University of California, Davis, veterinarians and the California Department of Fish and Wildlife. 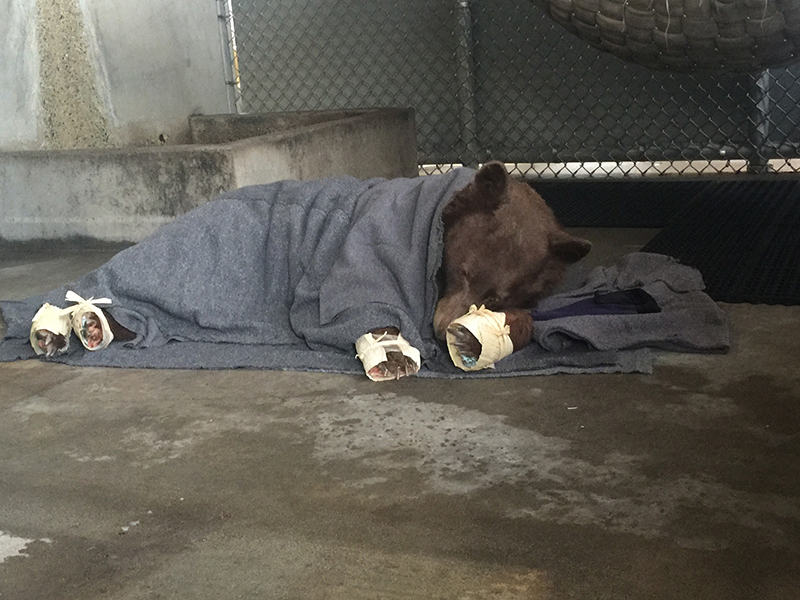 The bears, along with a 5-month-old mountain lion, were all brought to the CDFW Investigations Lab in Rancho Cordova for treatment in December after being found with severe burns from the fires that swept through Santa Barbara and Ventura counties. Deana Clifford, senior wildlife veterinarian with the CDFW and an assistant clinical professor at the UC Davis School of Veterinary Medicine worked to treat the burns, and enlisted Jamie Peyton, chief of the Integrative Medicine Service at UC Davis Veterinary Medical Teaching Hospital to help with pain management. Both bears had severe burns on their paws. 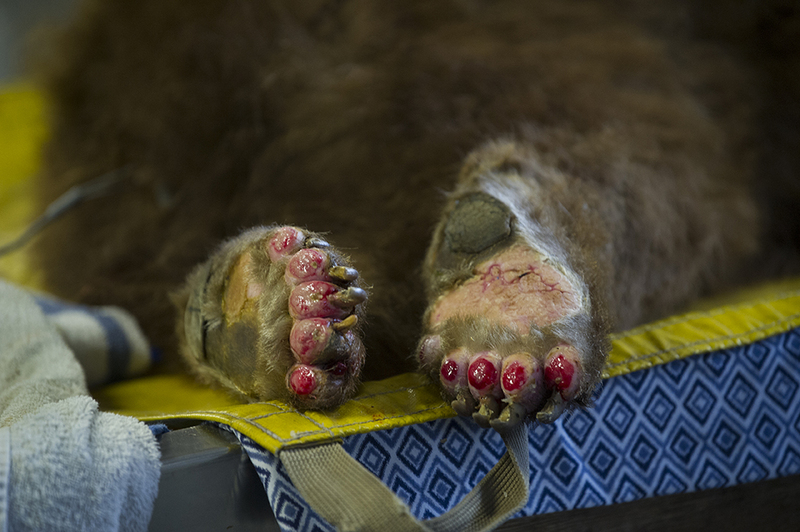 The younger bear, which was brought to the lab on Dec. 9, had severe third-degree burns on all four paws. Peyton initially estimated it would take four to six months for the bears’ wounds to heal. Giving them a long time to recover wasn’t an option. The team didn’t want to risk having the bears acclimate to people or captivity. Standard care, which would require frequent bandage changes, would also be difficult with a wild animal. The team also had trouble getting the bears to eat pain medication. Complicating the situation even more, they soon found out that the older bear was pregnant. Peyton remembered reading about a group in Brazil that had used sterilized tilapia skins to successfully treat burns on humans. While the treatment had never been performed in the United States and never on animals, Peyton decided it was worth trying. It took Peyton and her team several days to obtain the fish skins and sterilize them in the lab, but the payoff was worth it. Before the fish skins were sutured to the bears, the bears could only sit with their paws off the ground. 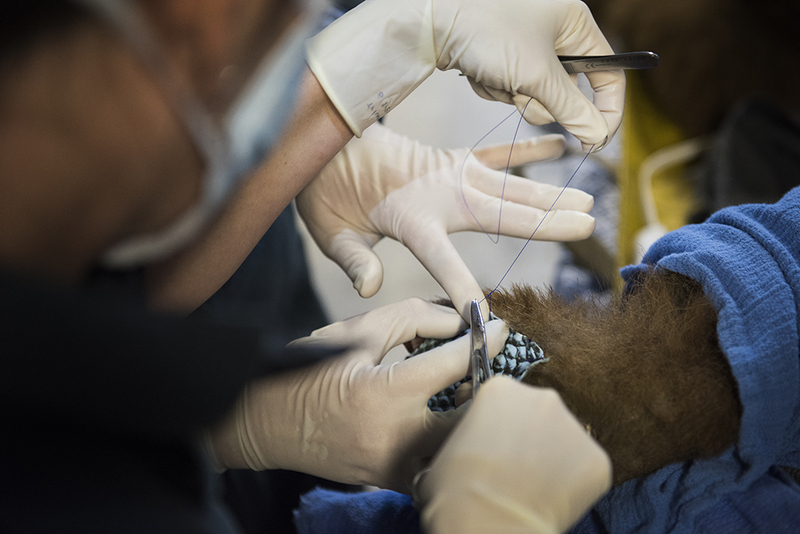 The bears also received acupuncture, chiropractic care, transcutaneous electrical nerve stimulation (TENS), pulsed electromagnetic field therapy, and cold laser therapy. All of the integrative therapies help with pain control and enhance wound healing by increasing blood and lymphatic flow. The team also worked with UC Davis veterinary pharmacists to create a new burn salve designed to ease the bears’ pain. Peyton believes all of these therapies played a role in the bears’ healing, but it wasn’t until the tilapia skins were applied that the biggest change occurred. In a matter of weeks, new skin had grown back on the bears’ paw pads. “In our view, there was no downside,” said Peyton. The fish skins are even edible, and no reactions to the skins were observed. The mountain lion, which received the same treatment as the bears, ended up eating his. Interested in a career healing animals? Animal science majors at UC Davis are well prepared for vet school. As undergraduates, students can work as interns in the veterinary medical school and in businesses such as a water buffalo dairy to get hands-on training. Read more on our majors blog. Peyton is excited about the possibility of using the treatment in the future on companion animals and is hoping donors can help make more research possible. She also sees potential in using the treatment on humans in countries which, unlike the United States, may not have access to skin banks. While the bears’ wounds are not healed 100 percent, Peyton says she’s praying that they do great in the wild. Both bears’ original habitat had been destroyed by fire, so CDFW officers moved dirt and logs to create separate winter dens for the bears in the Los Padres National Forest. They were released on Jan. 18. 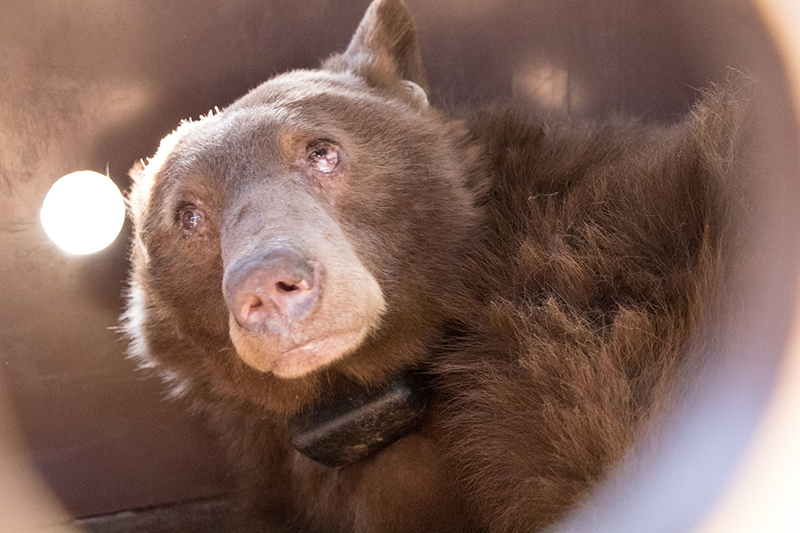 Each is wearing a satellite collar so CDFW can monitor their movements and survival.